From the haunted woods of the Swiss city of Geneva, here comes an infernal masked duo armed with their mechanized and uproarious Industrial Metal. Formed in 2017 in Geneva, a city in Switzerland that lies at the southern tip of Lac Léman, Industrial Metal masked duo Geisterwald is unleashing upon humanity this year their self-titled debut EP, channeling all their passion for heavy music and their musical backgrounds into their newborn spawn. Comprised of Harald Wolken on vocals, guitars and synths and Gaëlle Blumer on drums, and with all of the songs from the album being entirely sung in their mother tongue German, Geisterwald are ready to make an uproarious impact on the underground Industrial Metal scene, with the music found in their debut EP being a fantastic taste of what those two Swiss metallers are capable of when armed with their gas masks and their metallic instruments. The EP kicks off with an ominous intro sounding as if a beast is rising from a dark and tenebrous pit in the mechanized Alte Körper (which should translate as “old body” if I’m not mistaken), where Gaëlle crushes her drums while Harald alternates between deep, primeval growls and eerie clean vocals, resulting in a heavier-than-hell display of Industrial Metal infused with Neue Deutsche Härte. Just as insane and piercing, Kreuz (or “cross”) presents the duo building an industrialized atmosphere with their menacing sounds, with Gaëlle delivering both traditional metal beats and more factory-like sounds while Harald brings a touch of delicacy and lunacy to the overall music with his synths. Then get ready for a dark and demented Neue Deutsche Härte extravaganza titled Wolf, sounding and feeling intense, macabre and demented all at once, with its somber guitars and the howl of a wolf being the details that make it so compelling and vibrant. Furthermore, Harald’s vocals feel truly demonic amidst the thunderous sound of the drums by Gaëlle, showcasing the amazing synchronicity between them. And the last blast of modern metal music by this infernal duo of masked marauders comes in the form of old school Industrial Metal the likes of Ministry and Rammstein, titled Schlag Stärker (which means something like “hit harder”). Simply bang your head nonstop to such heavy tune, where we’re able to enjoy a merciless Gaëlle on drums while Harald does what he knows best, which is growling deeply and in the most enraged way possible. Whatever comes next for this talented duo is probably going to be even more insane and destructive than their debut EP, and while we wait for more top-tier Industrial Metal made in Switzerland let’s all go check what Geisterwald (which by the way is a wordplay in German for “ghost forest” or “haunted woods”) are up to on Facebook, including the dates for their wicked live performances, listen to their music on SoundCloud, and purchase a copy of their debut EP from BandCamp, from Big Cartel or from Amazon. As a matter of fact, I guess you wouldn’t mind getting lost in the haunted woods of Geneva and face the industrialized roars by Geisterwald, would you? Best moments of the album: Schlag Stärker. 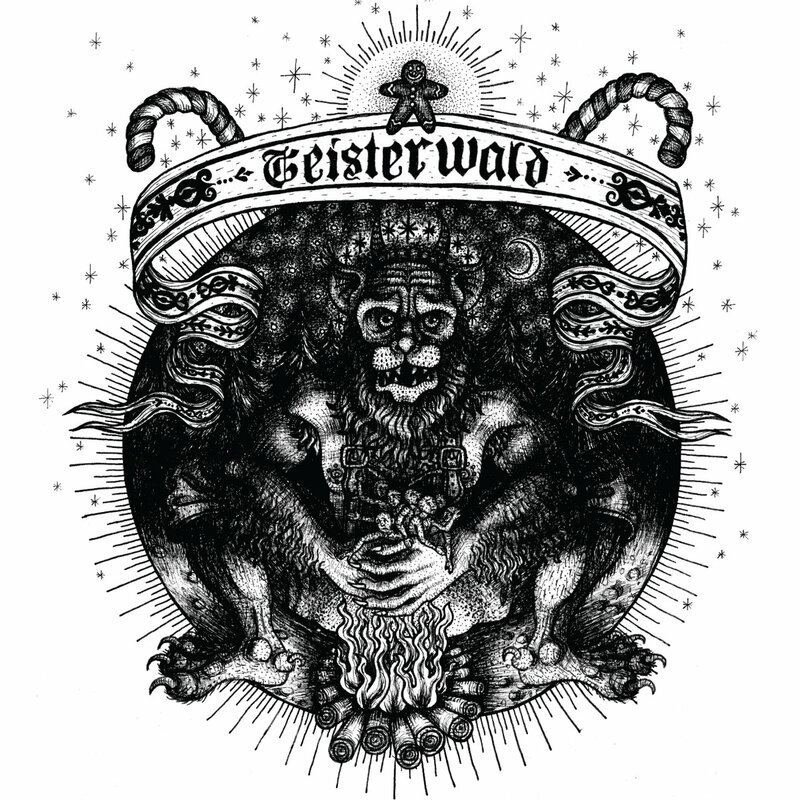 This entry was posted in 2018 New Releases and tagged alte körper, gaëlle blumer, geisterwald, geisterwald ep, geneva, harald wolken, industrial metal, kreuz, neue deutsche härte, schlag starker, switzerland, wolf by Gustavo Scuderi. Bookmark the permalink.